Dragonflies have been around for millions of years, and are very useful to have in a garden, as they are excellent predators of insects like whitefly, aphids and mosquitoes. Of course, they are beautiful too, with their jewel-like colours and delicate wings. 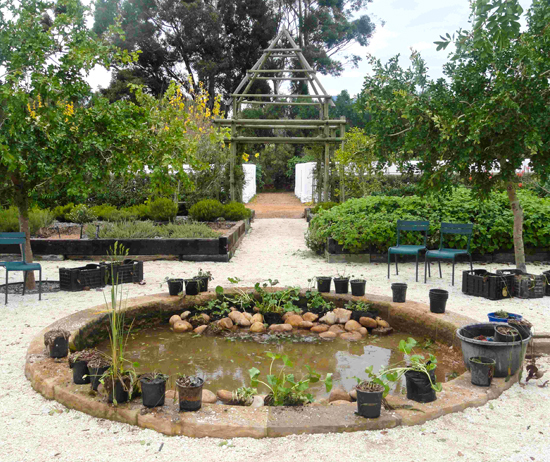 To make dragonflies feel at home in our garden, and to give them somewhere to lay eggs, we have planted a natural pond in the indigenous fragrance garden, and it’s all laid out just the way they like it. Dragonflies like to lay their eggs somewhere that the larvae can find little hiding holes while they grow, so we created different water levels by packing stones, gravel and pebbles, sloping gently from the shallow edge to the deeper middle. 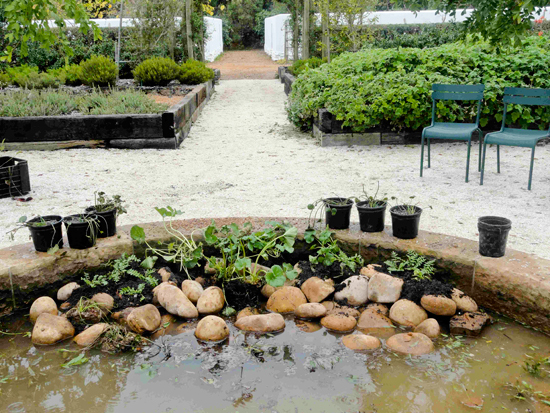 Along the edges we placed bog plants, like the large-leaved, edible river pumpkin Gunnera perpensa, as well as soft fernlike water parsnips Berula erecta, traditionally used as a toothache remedy. Deeper in the pond we planted waterblommetjies, blue waterlillies, and yellow nymphoides with lily leaves that will float on the water. To help aerate and keep the water fresh, we planted Vallisneria which creeps like lawn under the water. In time, the water loving plants will cover half the shallow pond with greenery with a variety of differently-shaped leaves upon which the dragonflies may alight. 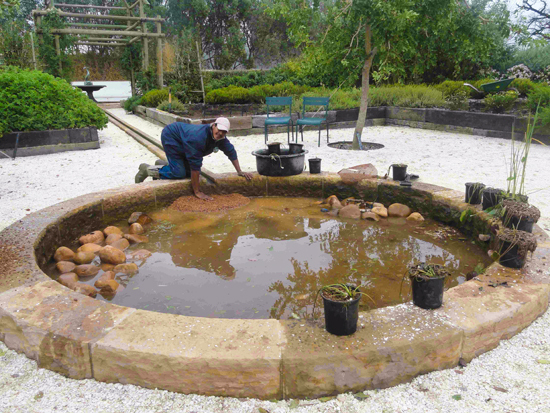 The final detail in our design (and we’re sure the dragonflies will approve) is that in order to protect their eggs and larvae, there will be no fish in this pond. So come visit our fragrance garden on a sunny day and we hope you’ll soon find dragonflies dancing around their pond. What about mosquitos? Do you have a problem with those in your area? Have any dragonflies yet?